← Confession #6: Oh the irony. The fact that simply walking out the door in Milan is synonymous with seeing something I’ve never experienced before rekindles my passion for this country daily. And often what I’ve never experienced before is something edible. And almost always that thing which is utterly new to me, is not only not new here, but part of the way things were, once upon a very long time ago. The old is constantly reborn in the guise of modern adventure. I’ve long lost count of the comestible “firsts” I’ve experienced since moving to Italy. 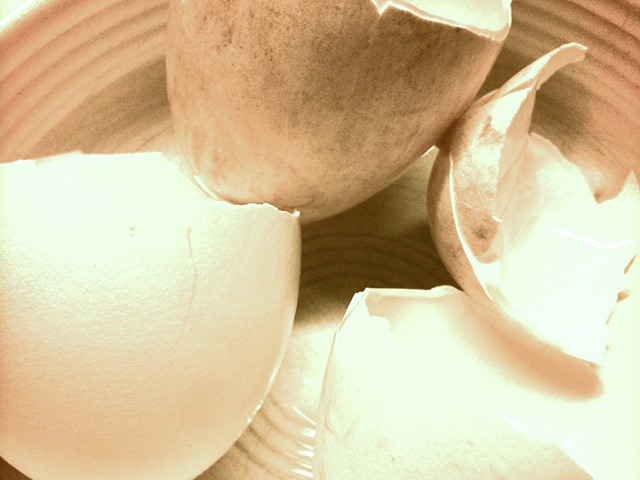 And just the other day, I added another to the innumerable list: goose eggs. 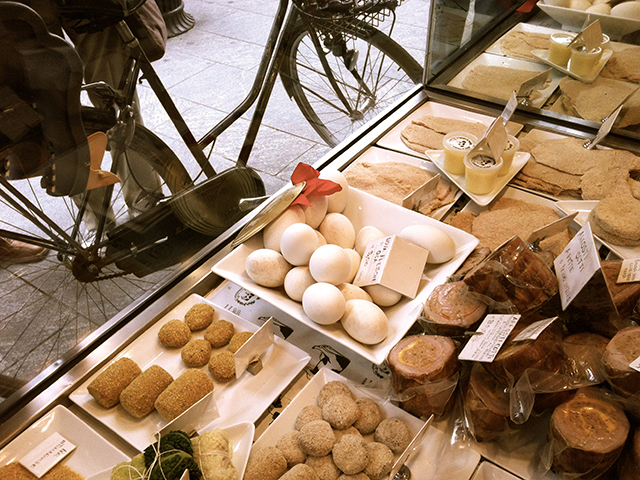 They were nestled comfortably in the window of my favorite butcher shop, Macelleria Walter Sirtori in Via Paolo Sarpi. The place is a working museum of food culture, a monument to old-fashioned, made-to-order service, and a mecca for the urban soul in search of the genuine, the real. Hence, the basket of large eggs, front and center adorned with a red ribbon and drawing a crowd. As the cashier explained to me, “We only have goose eggs when we have them.” Ah, I see. Naturally. I love eggs. I’m allergic to them, just slightly, but that’s not enough to dampen the attraction. They are just so damn beautiful. Perfect. Little oblate packages of life, little universes encased in porcelain. These were clearly bigger than chicken eggs, smaller than ostrich. Some were perfectly ivory, others mottled with being scrubbed almost-clean. 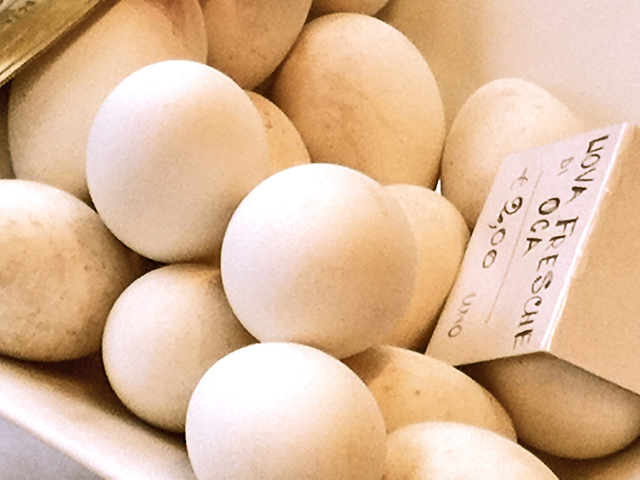 And their freshness was somehow made evident by the hand-written card: FRESH GOOSE EGGS — 2 EUROS EACH. (Type-setting doesn’t compete under the circumstances, does it?) I took two, enough to make an enormous frittata for four. Back at home, I felt almost intimidated by the barnyard wonders. They were so, well, big. And when I attempted to crack them against the rim of the bowl, their thick shells resisted my feeble whacks. They required tenacity, certainty. A small degree of meanness. Bam! That did it. 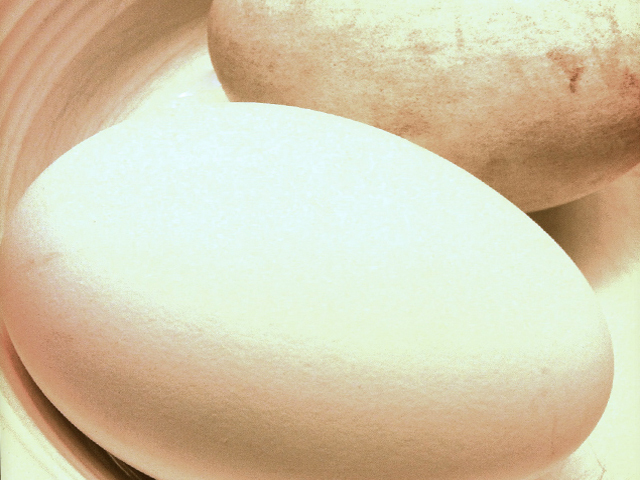 Out plopped over-sized yolks and whites which whisked easily into a light fluffy mass. The frittata was more or less a success, the flavor of the eggs being simultaneously more delicate and more decisive than chicken eggs. Hard to explain. I can’t say that I loved them, nor that I’ll repeat the purchase. But the experience—and that’s the important bit—was delicious. This entry was posted in ITALY, SAVORING. Bookmark the permalink. I haven’t tried goose eggs. They are available here, I just haven’t done it yet……I know I should. to me, a “goose egg” means “zero”. so i was greatly relieved when i read your blog and it wasn’t about zeroes, nothingness, despair, emptiness…..but eggs and eating! whew!